Coil coat process insures durable long lasting performance. Proprietary Duraglide non stick finish ensures baked items won't stick. Easy to clean and dishwasher safe, no scouring ever. 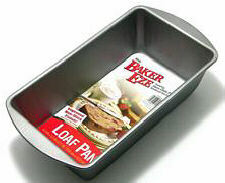 GS Baker Eze Loaf Pan 8"x4"
GS Baker Eze Loaf Pan 9"x5"